Poi, the fermented paste of the taro corm (from the taro plant) is an ancient and sacred life giving food. Poi is hypoallergenic, naturally gluten free and contains plant-based microorganisms that have been validated by research to be safe and highly beneficial. Poi is also considered to be one of the most digestible foods on earth and has been recently shown in research to kill cancer cells in the colon. Very few food staples exist anywhere in the world that can be considered hypoallergenic, rich in calcium, potassium, phosphorus, magnesium, a good source of B vitamins, contain vitamins A and C, minerals, and a small measure of high quality, easily digestible protein. Kalo, or Taro, as it is more commonly known, is not only nutritious but is considered to be a beneficial carbohydrate food that provides a high fiber, slow-release energy food source that may be beneficial for the more than 100 million people worldwide that suffer from diabetes. 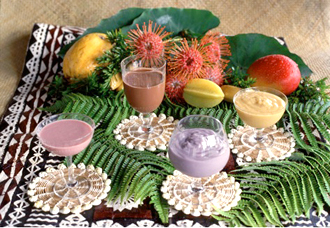 As taro ferments it produces precious and varied beneficial metabolites. Bacteriocins are one of these that exhibits powerful antibacterial properties. Some of the natural benefits of bacteriocins are: improved nutritional value of food, control of intestinal infections, improved digestion of lactose, control of some types of cancer and control of serum cholesterol levels. After years of scientific research, the Taro Dream Inc. has acquired a full range of cultured food science and manufacturing innovations based on the use of dehydrated Poi. Although these phenomenal products are not available for purchase on the mainland US yet, through the process of developing its first product line Taro Dream®, a full line of Poi-based, gluten free foods is preparing to be launched nationally. Nutrient dense, naturally fermented, dehydrated Poi that includes powerful plant-based beneficial microorganisms will also be offered. POI BABY®, a novel and delicious Poi-based food for children and elders will also fill a gap in the health needs of many of the most vulnerable groups of the population. Taro Dream, Inc. has funded years of feasibility studies, product research development, extensive test marketing and small scale manufacturing operations through the founder’s personal funds and time, as well as funding of over $600,000 in federal grants. TDI is currently donating their special nutrient-dense dried Poi to people with critical issues. Contact tarodream@msn.com for details.